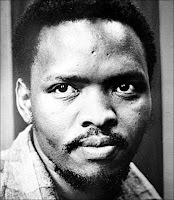 Home / Anniversaries / Apartheid / History / South Africa / Stephen Biko ... Born On This Day, 70 years ago. Stephen Biko ... Born On This Day, 70 years ago. The South African revolutionary and anti-apartheid activist Stephen Biko would have been 70 years old had he not been tortured and murdered by the South African State Police. He founded the Black Consciousness Movement which would empower and mobilize much of the urban black population. Since his death in police custody, he has been called a martyr of the anti-apartheid movement. While living, his writings and activism attempted to empower black people, and he was famous for his slogan "black is beautiful", which he described as meaning: "Man, you are okay as you are, begin to look upon yourself as a human being". Biko was never a member of the African National Congress but the ANC has included him in the pantheon of struggle heroes, going as far as using his image for campaign posters in South Africa's first non-racial elections in 1994. "They had to kill him to prolong the life of apartheid."